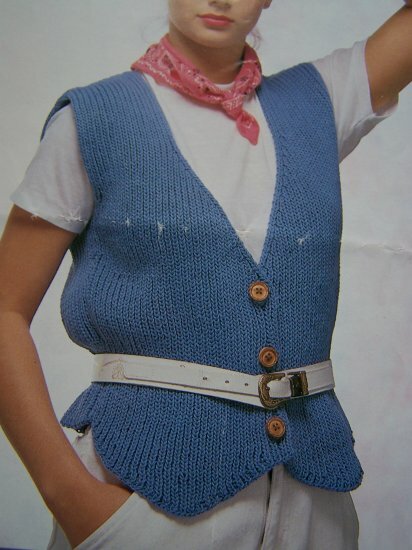 Ladies knitting pattern for women Casual deep V neck, 3 button casual vest pattern. Original pattern not a copy. Includes only the pattern not the completed item. 100's more listed. Inventory box 11. Pattern name: Cotton pop'n Leaflet # 8105. ** NOTE Instructions are in English** 1 page leaflet that has shelf wear and fold line. ** I have 100's of knitting patterns for women, misses, jrs, Men's, boys, girls, baby & infants, accessories and house and home. Measurements: Bustline 31.5 - 38". Length 17 3/4 - 19 3/4". S & H to the USA is .50 cents folded and mailed in an envelope. This one already has fold lines. S & H to Canada $2.00 folded in an envelope. Ask about combined shipping.